Riding seasons can be limited by weather; don’t let summer be one of them. The Turbine jacket was created to escape the days when the sun is overbearing and the pavement is melting your tires. The full bore air mesh and PE protection creates a perfect combination of comfort and safety. Maximize your warm weather riding by slipping into a Turbine. We checked a few different size jackets with a tape. We feel this model runs true to size. The jackets are sold in ordinary “alpha” sizes, so you can choose the size you normally wear in men’s clothing. For those that want to check the size based upon their chest measurement, we put together the chart below. This chart shows the chest size ranges for each jacket and max belly. The taper on the jackets is very mild, so most people (even those with a bit of a belly) should easily find a fit. The belly has side zip adjustments to expand about 1 inch on each side. Just make sure the size you choose will be big enough for both your chest and belly. if you have a more athletic build (big drop from chest to belly size), this jacket also has some velcro adjustments at the waist to tighten it down. Most people should find an easy fit. 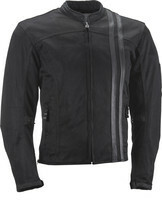 The Highway 21 Turbine mesh jacket is a great casual style meant for the hottest weeks of the summer. Its a minimalist design and the entire shell is open weave mesh material, so air should flow right though. This jacket includes a full set of PE Foam armor for the shoulders and elbows and back. The sizing adjustments are plentiful, so you’ll be able to adjust the fit so you’ll be comfortable. Adjustments include zip expansions of around 1 inch on each side, as well as velcro adjusters to tighten it down. As I mentioned above, this jacket is for hot weather use. But it does include a windproof and waterproof liner that you can use under the jacket. The liner can serve as a wind block for use in slightly cooler weather… cool mornings or traveling through mountainous areas where daytime temps vary with altitude.